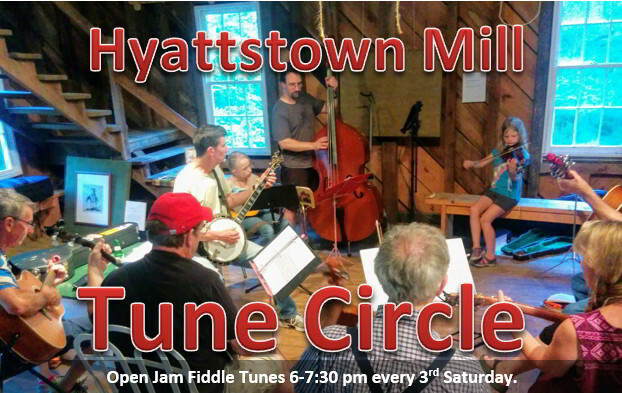 If you play an instrument and like fiddle tunes, come join us at 6 p.m. for the Tune Circle, every 3rd Saturday at the Hyattstown Mill. If you’ve been to fiddle jams, you know they come in many varieties, and with different customs and unwritten rules (or sometimes written). We never know exactly sure how our Tune Circle will shake out (it depends who shows up — come and help shape it! ), but it’s always relaxed and friendly for all abilities and all ages, and most of all a good time. Irish? Old Time? Bluegrass? Something else? All play all-the-time, or take turns? Fast/slow? Allowed instruments? We’ll start out by going around the circle and each player will suggest a tune (passing is OK). If enough people know it, we’ll play it. See the list below for a starter (reading is just fine if you don’t know the tune). We’ll add to this as we go. The person calling the tune sets the tempo, and gets to call whether it’s all-play or hybrid (all-play through once, then trade to who wants to take one). We’ll adjust based on how many are in the circle. Non-traditional instruments are OK, as long as you can play with the group and aren’t louder than the rest (electrics must be turned down, percussion played quietly). We’re not going for purity, but we want to have fun playing music we love. If you have a copy of the Fiddler’s Fakebook, bring that, but if not don’t worry. We don’t have to stick with only tunes from that book. Here are a few tunes to start out with. I’ll have some printed copies to share. If you have some tunes you’d like to play, it’s good to bring some copies in case not everyone knows them (and send them to me and I’ll put them up here). Got a lot more tunes in the book now. I’ll bring a few copies but if you want your own, you can print one for yourself. Here’s the whole book to print.